Mythbusters has posted the trailer for their “Zombie Special” which was filmed on the grounds of Alameda’s retired Navel Air Station using many zombies from the Bay Area. The episode will explore zombie myths with the help of Michael Rooker who played “Merle Dixon” in AMC’s The Walking Dead. The Mythbusters zombie special comes out the same week as the launch of the fourth season of The Walking Dead which premieres on October 13. In addition to the episode trailer they’ve also posted “Mythbusters‘ Top 10 tips to outlast the zombie apocalypse.” The zombie episode of Mythbusters can be seen on Discovery October 17 at 10 p.m. (PST). We’re especially excited about this episode as our very own Maddie Greene was a member of the zombie horde during filming. 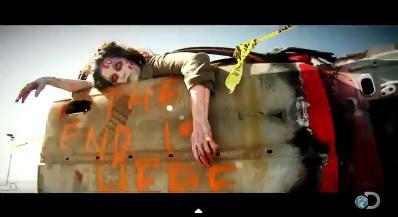 You can see her in the trailer hanging on a rusty door around the 22 second mark (also screen capped). This appearance on Mythbusters is only the most recent step in Greene’s evolution from Zombie Scholar to actual zombie. She started off publishing the blog “Zomploitation” on which she’s reviewed nearly 200 zombie films (taking a hiatus in 2009), she founded the Madison Zombie Lurch in 2005 (perhaps the first Zombie Protest March in the country), and had a starring role in the original version of Z-Town: The Zombie Musical (she can also be heard on the cast recording available at CDBaby). 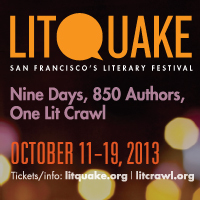 Litquake is an annual Bay Area event that seeks to foster the region’s sense of literary community. Between October 11 and 19 venues open their doors to let in the literature-hungry hordes for readings, workshops, panels, happy hours, and more. Tucked in amongst the established authors, poets, barfly wordsmiths, professors, and publishers are a handful of events focused on the literary form of funny books. First up is a visit to the Cartoon Art Museum, 655 Mission Street, on October 15 for Sumos and Saints which features Gene Luen Yang and Thien Pham discussing “comics, education, and ‘80s cartoons.” Gene Yang is the creator behind the critically acclaimed and well honored American Born Chinese. Thien Pham is the co-founder of handmade comic distributor Global Hobo. In 2011 Pham and Yang partnered to publish Level Up. The talk starts at 7 p.m.
Inconveniently, October 18 is a night only Jamie Madrox can fully enjoy. On the 18th at the Variety Preview Room, 582 Market Street, there will be readings from Super Stories of Heroes & Villains. This anthology, edited by Claude Lalumière, features a collection of original superhero focused short stories. According to the publisher “you’ll find the exploits, machinations, and epic mêlées of these superpowered aliens, undead crusaders, costumed crime fighters, unholy cabals, Amazon warriors, demon hunters, cyberpunk luchadores, nefarious megalomaniacs, daredevil sidekicks, atavistic avatars, adventuring aviators, gunslinging outlaws, love-struck adversaries, and supernatural detectives.” Joining Lalumière at this event will be authors Tim Pratt and Camille Alexa. A Q&A about the book will be moderated by Terry Bisson. The event begins at 7 p.m.
At the same time the Cartoon Art Museum will be hosting “Comics on Comix” which will feature comedians riffing on comics ranging from Superman to Mad Magazine. Comedians expected to perform include Joe Klocek, Ivan Hernandez, Karen Macklin, Tom Smith, Mike Spiegelman, and Marc Weidenbaum. It’s always nice when two of my passions overlap. This time it’s film festivals and comics. The United Nations Association Film Festival, taking place mostly in Palo Alto, will be screening “The Comic King of Guatemala” on October 23 at 5 p.m. The short documentary tells the story of a passionate comic loving duo who tackle the challenge of opening the first comic shop in Guatemala. It’s an uphill battle not only due to the high illiteracy rate in the country, but also the lack of distributors willing to send new titles. The film screens with “Strong Enough to Fight,” which exams Kenyan youth leaving behind ethnic prejudices when they enter a boxing club, and “Familia Araya,” which follows a foundation’s efforts to use hip-hop to create positive change for kids who have been abused. The trailer for “The Comic King of Guatemala” is below followed by the festival’s description. The Comic King of Guatemala – Teaser from Oh My! on Vimeo. 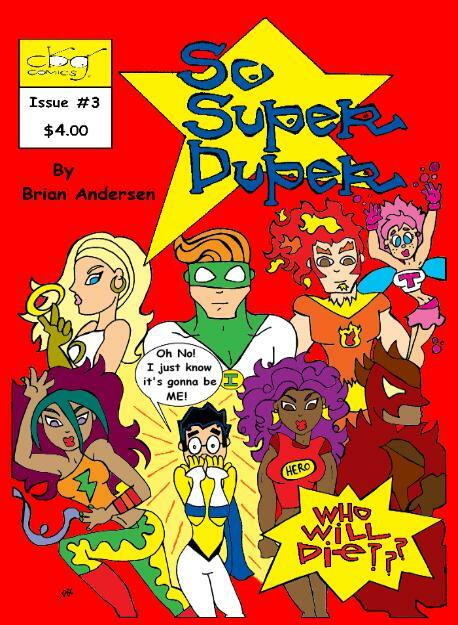 So Super Duper follows the journey of Psyche, a gay superhero, as comes to terms with and embraces his sexuality. 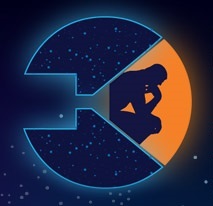 Earlier this year, creator and San Francisco resident Brian Andersen has collected the first 12-issues of the series into a shiny 326-page trade paperback. This week Andersen appeared on locally produced LGBT focused talk show 10 Percent with David Perry. You can watch the interview below, but also read some recent interviews with Andersen at ComicBook.com and the San Francisco Bay Guardian. Ever want to dress up like a superhero (or villain) outside and in public, but were nervous about doing it alone? Good news, all of your dreams can come true on Saturday during the 4th annual Superhero Street Fair where a few thousand are expected to don tights, capes, and masks. While you’re perfectly welcome to slip into that Speedball costume you typically reserve for only wearing around the house, the Superhero Street Fair encourages attendees to become their own superhero (or villain). It provides an opportunity for those folks who don’t have a well stocked costume closet to hodge podge a costume together out of items around the house, dream up their own powers or skills, and invent an alias. Showing up as a hero (or villain) will grant you a $10 entry fee, a sticker declaring you a SF superhero, a drink ticket, and free access to activities throughout the fair. The Saturday event includes a Superhero bootcamp, a visit from the Jack Kirby Museum, a number of DJs, fire performances, android performances, a costume contest…and more. Many of the details are below using my superhero powers of copy and paste. The rest can be found at http://superherosf.com/ or the event’s Facebook page. Five years and 140-pages after first putting ink to paper Omar Morales is hoping to see his Vatican City superhero, The CruZader, make it to print. The Bay Area-based Morales is currently seeking assistance through Kickstarter to help cover the printing costs of publishing the full color graphic novel. As of this writing Morales is a little more than half way toward his $10,000 goal with more than a month to go. He recently announced that Paul Gulacy, considered one of the pioneers of the graphic novel medium, will be illustrating the cover for CruZader. In 1978, Gulacy worked with Don McGregor to release the first direct market graphic novel Sabre: Slow Fade of an Endangered Species. He’s since worked with most major comic publishers and his style has been seen illustrating big name characters from Batman to Star Wars. Morales has also tapped illustrator Ray Dillon, who’s work has been seen under the banners of Marvel, IDW, and Image, to produce a kickstarter exclusive sketch featuring The CruZader battling a vampire. 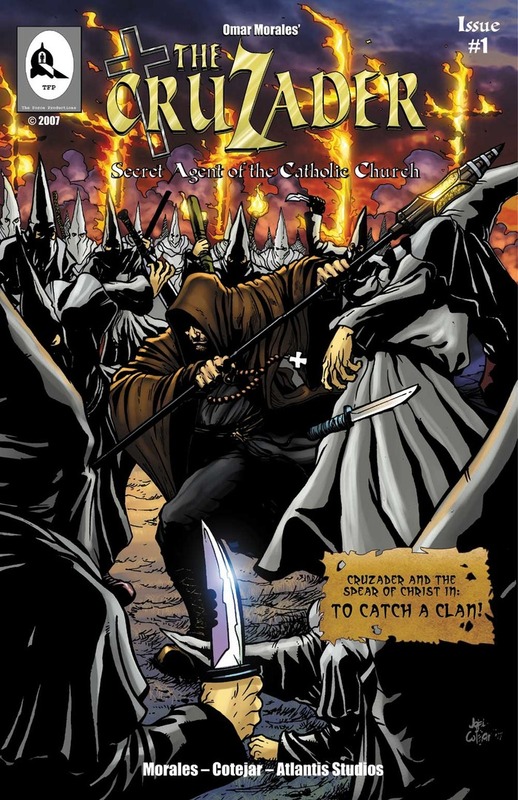 The story, from creator and publisher Omar Morales, revolves around the monk-like title character, Antonio De La Cruz, a reluctant priest who is re-trained as a holy warrior for the Pope. De La Cruz must embrace his destiny in order to defend the Vatican from an invading army of radicalized terrorists—who are much more than what they appear. The Cartoon Art Museum will be saying “farewell” to Metropolis on September 29 and “hello” to The Dreaming on October 5. In conjunction with the 25th Anniversary of Sandman the museum will be featuring a Sandman exhibition running from October 5 until March 16. There’s currently very little information available regarding the exhibition beyond a small teaser on the museum’s website. Starting on October 30, Vertigo will be launching a new Sandman miniseries featuring the art of J.H.Williams III. The new series will tell the story of Dream before he was imprisoned by the Order of Ancient Mysteries in 1916. We’ll have more information on the exhibition as it becomes available. On September 23, the public is invited to hear presentations from the three finalists being considered for the mid-Crissy Field site in The Presidio. Final presentations will be made regarding the Lucas Cultural Arts Museum, The Presidio Exchange, and the Bridge/Sustainability Institute. This meeting will allow the three groups to present their final proposals to the public and respond to questions. 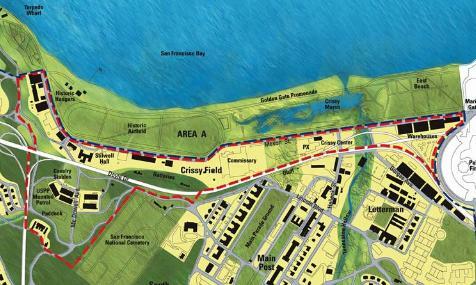 There will be a final public meeting on the designs with the Presidio Board of Trustees on October 24. The September 23 meeting is at 6:30 p.m. at Herbst in the Presidio, 385 Moraga Avenue. Crissy Field is part of Golden Gate National Park and looks out over the Bay toward the Golden Gate Bridge. The proposals are being considered for a space that was formerly a Commissary during the area’s previous life as a military base. Due to it’s status as the largest national park within an urban setting the Presidio Trust is required by Congress to follow strict guidelines in conjunction with the National Park Service when planning development. Developing the 100,000 square-foot Commissary into museum space is one of the primary objectives of the plan established in 2002. If you are a local comics creator and have printed a minicomic, please contact us by October 15th, 2013 and let us know if you are interested in being a part of this event. Please give us examples of your work. The Festival may run both Friday, November 29th and Saturday, November 30th depending on the amount of people who sign up. The first event ran two nights and was lots of fun with readings and projections on the screen. Be a part it, network with other creators, showcase your work, and sell your mini-comics at the store. Contact us at hello at the escapistcomics.com, call us at 510-652-6642, or come by the store. You probably should call us first before stopping by. We may want to carry your minicomics before the event.